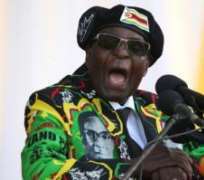 Zimbabwean President Robert Mugabe, 93, has a long history of making colourful or controversial remarks during a reign that has spanned nearly four decades. Mugabe's speech when Zimbabwe won independence was more conciliatory. "I am still the Hitler of the time. This Hitler has only one objective, justice for his own people, sovereignty for his people, recognition of the independence of his people. Before his first wife died in 1992, Mugabe started a relationship with Grace, whom he married in 1996. False reports of Mugabe dying were a feature of his old age.